Fancy Treehouse. : So what if I like pretty things? So what if I like pretty things? Hello guys! Whoa, it's March! Today is not the best day in the world for me. Gabe got picked for Jury Duty so we can't go on our anni trip next week. BUT, I'm trying to play the glad game as a wise little girl named Pollyanna Whittier taught me to do. I still have the love of the best guy in the world and my baby Birdie. PLUS, we can still go for a short weekend trip. So, it's just taken me a few hours to get over this. This is what I wore yesterday when we were fully enjoying our day off. It was a pretty nice sunny day. We didn't do anything particularly special but coffee, food, and shopping is always special in my book. Other than that, I am obsessed with "Crazy Heart" one year too late. There's a reason I don't like to watch good movies..I can't shake them!! Well, Gabe gets done with his Jury Duty at 5 and we're going to Chipotle to get the BOGO deal. :) We used to go to Chipotle all the time when we had no money so it's fine nostalgic fun! Two thumbs up. How's your day going? Did you have any fun treats...receive any good news...fall in love?? :) You never fail to make me smile with your sweet comments. 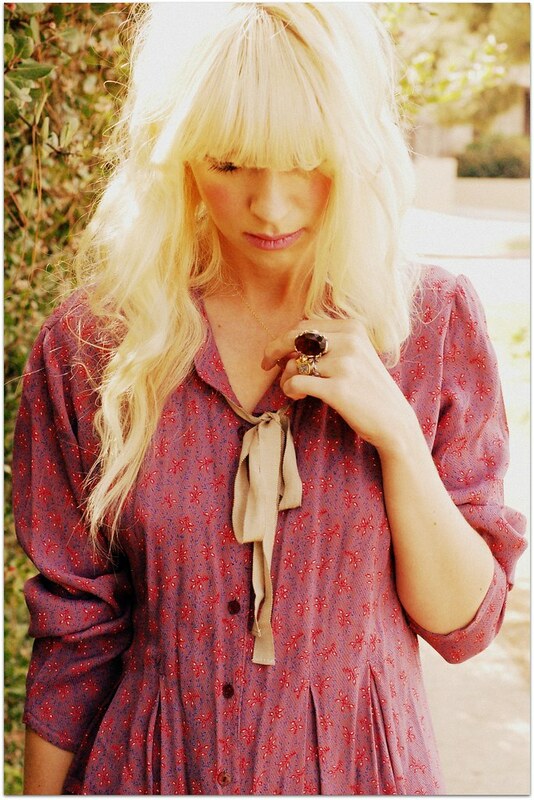 PS: The winner of the Sea of Bees Ring and Necklace is Nicole of mintypeaches. Email me Nicole! PPS: The surprise bonus winner of a Bird ring is Dani of The Daily Dani! Email me Dani! Love the dress and your cape! That bag is so unique and adorable! You are so good at styling over-the-knee socks. I love it! you are just so flippin adorable!!!! love this dress so much. and can i just go ahead and comment on the gorgeous turquoise dress too? and the cute little lavender dress and the sweater over it????? all so flippin adorable. this is so cute, I love your knee socks and your hair this day especially! I love the dress and the cape together. They make for a cute combination with the floral print and the petal sleeves. And those turquoise rings are lovely! You look so darling in that trench...love it! love chipotle too! yum yum! oh boooo on jury duty! does Gabe know he can postpone the jury duty to one month later? ***like if he wakes up tomorrow morning feeling (cough, cough) sick*** worth a try for a longer vaycay, no? Looooooooooooove your Hello Kitty ring! I think I love you more every time you make an entry. I love the glad game but I'm a big Haley Mills and Pollyanna fan. My husband got chosen for jury duty this week and hopefully can get out of it since he's needed at his job and it could be an issue if he misses a day. Your outfit is spectacular. I tried to use something more than people's usual "amazing, awesome, cool, gorgeous, beautiful, lovely" tag-lines. I haven't seen crazy heart but was 2 seconds away from doing so and even had the disk from netflix. Maybe one day I'll actually see it though. 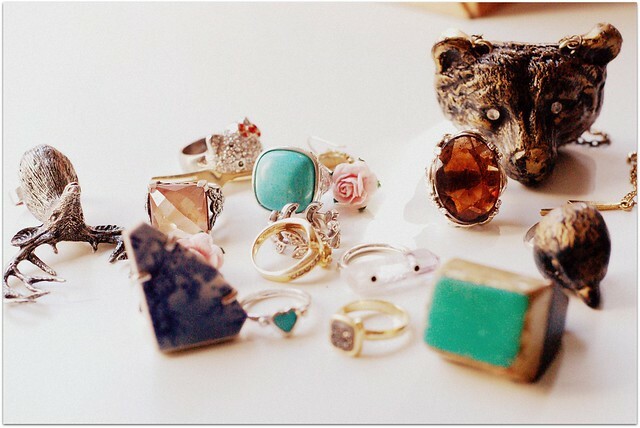 i totally love the bear and deer ring!where r they from?? I love the colour combo in this outfit...red and purple and camel! Also, jewelry shots are always appreciated. Civic duties are such a bummer sometimes but I hope that you don't give up plans for a fun get away soon! reading your cheeriness makes my day every day so thank you for that! I'm sorry about Gabe's jury duty. I would be pissed, but I think you're handling this beautifully. You guys will still have a great anni! I have no doubt. Question though, what's a BOGO? You are always so lovely! those fluffy sleeves are so fun! as always, so jealous of your gorgeous sunshine. My husband and I discovered the most delicious churros I've ever had in my life about 25 minutes from where we live...that was fun. and now I'm addicted. i never tire of you wearing those flats. they match everything. sorry to hear about the bad news on your shortened vaca. but getting away for a few days is better than none. and thanks for the tip on crazy heart. i just moved it to the top of my queue. I must have that bag!! Do you know that you'r in a french magazine called "Public Look"? Red socks! I love those. Hope you find a way or do some other lovely thing instead! I totally adore you and your blog...I've been following your blog for a while... and I have to say I'm getting more and more into it! every day I'm looking forward to se your original, romantic and very beautiful outfits!! you are just so great!! love it!! You're my the most favourite one!! You jewelry is so gorgeous, wow! I am in love with that trench! It is so freakin cute! The red socks look so good. I really like that ring of yours, the green and golden one. I like this dress, and with red socks is amazing ! You're so good at mixing patterns and colours, looking fabulous! Love the dress it's so pretty. this dress is lovely!!!! and you look amazing in it! your coat is stunning! best sleeves I've seen in a while! loooove that purse-- i think i saw it at anthro and now i wish i had gotten it! You are such a peach! This blog always brightens my day. I do hope you have a much happier week! 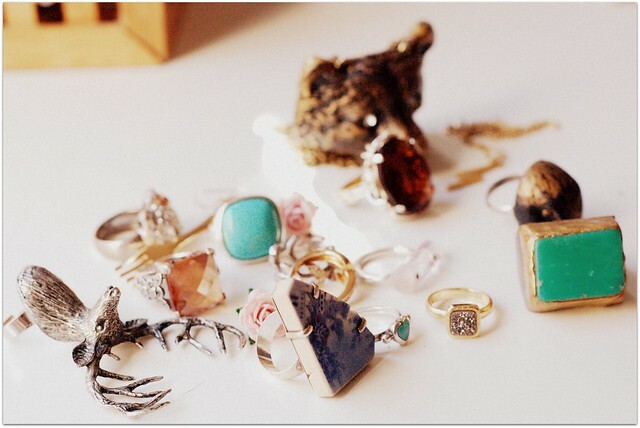 And great collection of rings! Oh lovely outfit and lovee the picture of the nail polishes.